Critics take Tom Cruise's measure as "Jack Reacher"
After months of Facebook and Twitter conversations, fans of Lee Child's Jack Reacher novels will get to see for themselves how Tom Cruise measures up as the larger-than-life vigilante. "Jack Reacher," a film based on Child's fifth Reacher novel, "One Shot," opens in theaters today with Cruise in the title role. That's what has set the online world abuzz -- that the trim, 5-foot-7 actor can take on the role of a literary loner, described in the mysteries as 6-foot-5 and 250 pounds with a 50-inch chest. The author himself has weighed in on the conversation, saying that the actor, despite his size, conveyed Reacher's spirit as a "force of nature." More recently, the movie has come under fire because of its content. It centers on the hunt for a sniper and some say it cuts too close to real events in the wake of the Sandy Hook school shootings. In response to the shootings, the movie's premiere in Pittsburgh (where most of the film was shot) was postponed and scaled back to a special screening with no red carpet. Also postponed was a New York tribute to Cruise. Critics have been less than generous about "Jack Reacher," with the movie scoring a 61 percent approval rating on the aggregate site Rotten Tomatoes. Claudia Puig of USA Today: "Cruise is competent as the hard-hearted righter of wrongs, convincing as a guy who's fairly impervious to danger. Reacher is not all that different from the guy he plays in the 'Mission: Impossible' movies. But the movie is a far cry from those well-made spy thrillers. 'Reacher' is limited by a lack of originality and hampered by thematic clichés and generic action sequences." Betsy Sharkey of the Los Angeles Times: "It's a great character, but one that doesn't suit Cruise. In Reacher's case size matters -- it's integral to the way he wins the day. Tightly wound, Cruise can do; physically overpowering is a stretch. But it's Reacher's interior life that is the real issue. He communicates a world of hurt -- absorbed and dispensed -- in his cool, calculating looks. The actor can do cool and calculating, it's the meaning behind it that never flickers to life. 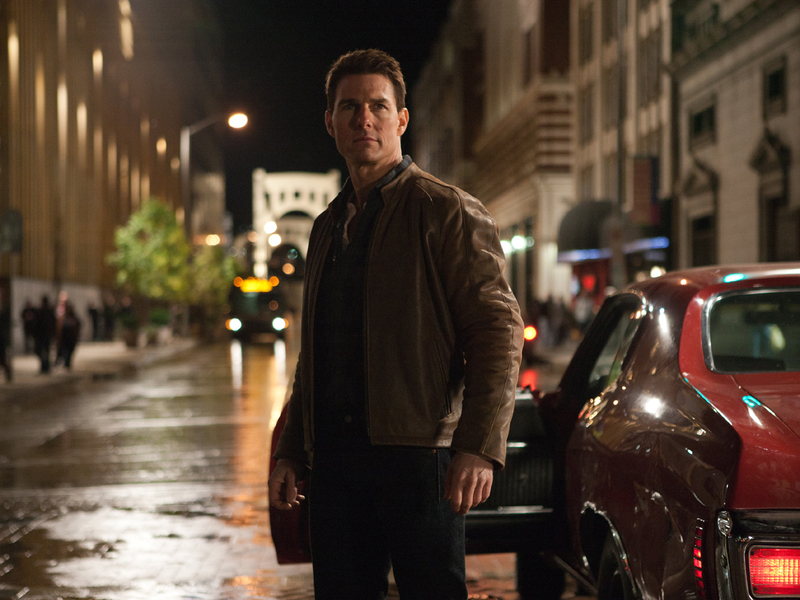 "Jack Reacher" plays like Cruise on cruise control." Michael Phillips of The Chicago Tribune: "(Director Christopher) McQuarrie, who wrote "The Usual Suspects," is a real writer; his banter has snap and bite. His directorial skills are still catching up with his writing skills; the movie loses steam in the final half-hour. Up until then it's diverting stuff. But it's not easy to take "Jack Reacher" in the intended escapist spirit. Not with so many close-ups of so many bullets, and so many guns given their glinty moment in the sun." Todd McCarthy of The Hollywood Reporter: "Tom Cruise might not be the 6-foot-5 rock described in the books, but he makes the title role fit him like a latex glove in a winning turn that could spawn a popular new franchise for the star, if public reaction to Christopher McQuarrie's film is as strong as its fun quotient warrants." Mark LaSalle of the San Francisco Chronicle: "As devised by Child, Reacher is a massively built guy, and so Cruise is on the diminutive side to be playing him. But don't underestimate Cruise's will and his ability to convey single-mindedness. Like Paul McCartney's music, Cruise's acting is easy to dismiss when you haven't experienced it in a while. But when you encounter it -- not the idea of it, but the genuine article -- you know the man has something. A routine thriller automatically gets a lift. It can't really be garbage if it's a Tom Cruise movie."